It is impossible for conventional player system, a tone arm and player board are united, to prevent sympathetic vibration caused by rotation of the turntable and motor driving. 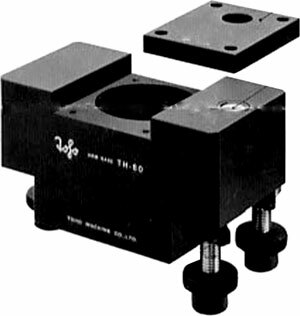 Using out TOHO base model TH-80, the tone arm itself is completely separated from the vibration source. It is an arm base which is made of cast iron cut-processed and heavy enough. It adopts a function to adjust the height within the range from 0 to 35mm and provide a built-in level for balance adjustment. Various arms can be mounted by changing arm mounting plate. Toho TH-80 / TH80 owners manual, service manuals and schematics are for reference only and the Vinyl Engine bears no responsibility for errors or other inaccuracies. The PDF files are provided under strict licence. Reproduction without prior permission or for financial gain is strictly prohibited. This website is not affiliated with or sponsored by Toho.